I think she looks great in it! I also picked up some yarn and Last Minute Knitted Gifts. But more about that later! It's difficult to believe anyone with this face is capable of the wanton destruction of everything in his immediate vicinity, isn't it? Like Alison says, it's a good thing he's so cute! Saturday night brought the market animal auction, cake auction and wine barrel auction (the boys were planting the barrel in yesterday's post). Since the auction raises money for the kids' college funds and for 4H and FFA (Future Farmers of America), the community is always very generous. Several kids walked away from the animal auction with over $10,000 to add to their college bank accounts. But the moment that took the cake, as it were (I can't help the pun - it's a sickness!) for me was the money put up for a single strawberry cheesecake that looked like this one (without the pieces cut out, of course). Are you ready? $1,800! Last year it went for $500. That's quite a jump, eh? It was a bidding war, as you may have guessed. In the end, the woman who baked it won it back with the help of her bidding coalition. ;) And the kids all benefited. It was wonderful! The fair ended Saturday night and Sunday morning was clean-up, so we went back to help. 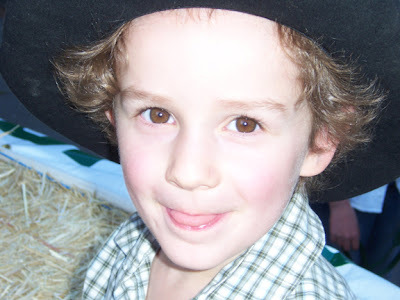 #1 Son was anxious to help his older friends who had had animals sold at auction the day before. The sweater was for #1 Son's Sensei(s), a husband-wife team who just had a baby girl! The party was on Tuesday. Whew! What a perfect little teeny sweater! I love the color- I bet it looks even better on! Wow, an $1,800 cheese cake! That's very generous. I won't be able to stop thinking about it now that I looked at the picture. How nice it is to know that there are still some wonderfully generous people around! I think candy floss is one of the very few blue food I will eat. Looks like you had a fantastic weekend all around. I like the baby sweater, too! I am glad all the money went to the kids! I can't believe the $1,800 for a cheese cake! Although I think my SO would easily drop that much on one. -=giggle=- I am glad to see that you had a wonderful Memorial Day weekend! That looks like so much fun! 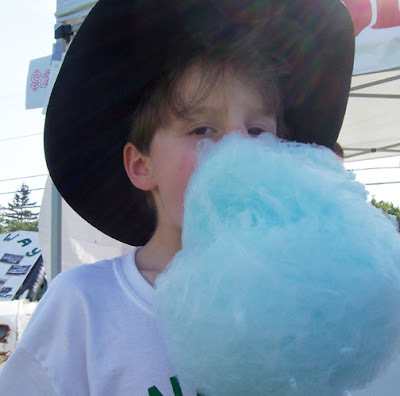 Of course, when kids come down off a cotton candy high, it can get ugly, LOL. But they're so cute. Your friend's sweater does look great! Mmmm I love cotton candy. 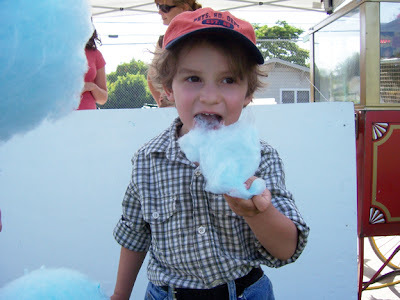 Mmmmm- the blue cotton candy is my favorite. Looking forward to hearing more about Ravelry. I love that little sweater. It's very cute. I love the buttons. They really add that little bit of je ne sais quoi to the garment. It sounds like you had a fun but tiring weekend. I hope this one is restful. 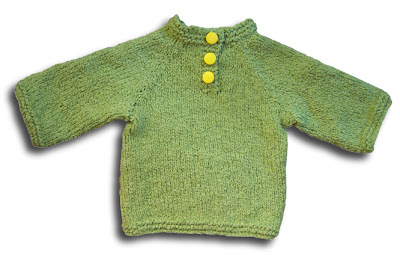 Loved the baby sweater in my current favorite shade of green! Clearly that's another book I'll have to add to my 'wish list'! Mmm...cotton candy. I love your childs placket neck pullover. You made that so fast! I've made it twice, it's such a fun knit. I don't even add buttons, I just fold down the collar and it looks like a polo shirt. But those were for boys. The buttons are super cute for a girl. Great job! Your kids are adorable. Well, yeah; they look a lot like my boys did at that age. Oh, how fun - thanks for sharing the pics! 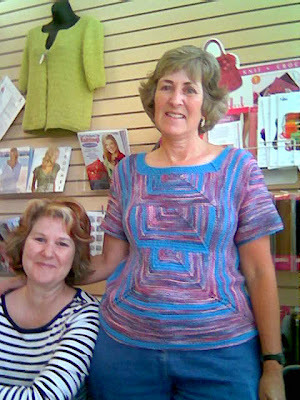 And that little sweater is totally adorable - what a great job you did with it! I love the sweater! I'm glad you worked out the gauge issues, because it looks so comfy in that yarn. So, another one in Ravelry, and I'm still knocking on the door. *sob* Okay, I'll try to be patient. Thanks for your comment on my blog! Let us know if Ravelry is worth it...I just don't know if I have time to give to that in addition to everything else!! That little baby sweater is soo cute. What a great idea to use snaps! I love that sweet little green sweater!!! I can't believe you already have it finished. You are my hero!